The Bookplate Society has had an unusual but rather impressive history. In 1891 a group of serious ex-libris collectors met and founded the Ex Libris Society, which for eighteen years published a well-illustrated journal, still a useful source of information about British bookplates. Falling membership and a financial crisis brought the Society to a sudden end in 1909, with much remaining to be published. However, The Bookplate Exchange Club, a group formed in 1899 within the Society, continued to thrive. Participants sent in thirty bookplates monthly, or fewer in hard times, and these were circulated by post. A member moved up one place each month until at the top he had 'first pick', after which he started again at the bottom of the list. This congenial fellowship survived for over eighty years, and it was the natural, inexpensive and much loved successor to the old Society. During the 1920s and 1950s other bookplate societies were set up, but these did not survive. From about 1970 Brian North Lee was discussing with Peter Summers FSA (1910-1994), the Exchange Club's last secretary, ways in which communication between collectors could be extended and enriched. They came up with the idea of founding The Bookplate Society. This began in 1972, and the plan was that it should hold meetings in London four times a year, and that a Newsletter should keep people in touch. This Newsletter began modestly, but was quickly expanded, and contacts with the international collecting fraternity grew. In 1979 we arranged a comprehensive exhibition of British bookplates at the Victoria and Albert Museum in London, and a meeting attended by a number of overseas visitors was held over a weekend at Gray's Inn Library. These were very exciting days, for not only were we as a society 'on the map' again, but we felt we had come of age, and this belief was confirmed when in 1982, as a member society of F.I.S.A.E. (Fédération Internationale des Sociétés d'Amateurs d'Exlibris) we hosted the 19th International Ex-Libris Congress at Keble College, Oxford. The proceeds from this highly successful event enabled us, in 1983, to close the joint membership arrangements with The Private Libraries Association and to extend our publishing programme. The Bookplate Journal was the brainchild of Professor William E. Butler, and it has gone from strength to strength. The Newsletter was cut down in size, but as a more than adequate compensation we started to supply a book free to members each year. The Bookplate Journal is published each Spring and Autumn and in 2003, under the editorship of Paul Latcham, started its Second Series in an enlarged and much improved format with 72 pages per issue. There are generally two or three substantial and well-illustrated articles, sometimes a book review, bookplates reproduced for identification, a detailed history of a bookplate, and an in-depth study of an artist's work, with a check-list. Although principally about British bookplates and their artists and history, the subject-matter extends to bookplates produced in other countries. Most back issues are still available. Indexes are printed and supplied to members frm time to time. The publications page on this website has a list of articles which have appeared in The Bookplate Journal during recent years. From the second half of 2009 Peter Youatt has taken over the post of editor following Paul Latcham's retirement from the role he carried out with great skill and success. The Bookplate Society Newsletter, issued in A5 format, is now published half-yearly in July and February. It contains news of meetings, books and magazines, details of new members and their bookplate interests, bookplate competitions, illustrations of members' bookplates and a 'wants, offers and queries' section, free to members. An important feature is the detailing of lots in our popular bookplate auctions. These have rightly taken over from the old Exchange Club, for every member has an equal chance of acquiring ex-libris, and often half the lots go to postal bidders. Only members may bid in the auctions, of course. Every six or eight years we update and republish our list of members, and, since it also details particular bookplate interests, it is an invaluable means of putting collectors in touch with each other. In 1983 we also began issuing a book to members as part of the subscription. The following have been published under the Society's aegis: The Bookplate Designs of Rex Whistler (with Private Libraries Association, with which we were affiliated 1972-82), 1973; Early Printed Book Labels (with PLA), 1976; Bookplates signed 'W.P.B.' (1896-1928) (with James Wilson), 1978; Bookplates in Britain (with the Victoria and Albert Museum, HMSO), 1979; J.A.C. Harrison Artist and Engraver (with Forlaget Exlibristen), 1983; London Bookplates (with the same), 1985; The Bookplate Designs of Franz von Bayros (with James Wilson), 1986; The Golden Era of American Bookplate Design: 1890-1940 (with Forlaget Exlibristen), 1986; The Ex-libris of Philip Hagreen (with the same), 1987; The Bookplate Designs of Austin Osman Spare (with the Keridwen Press), 1988; Some Yorkshire Bookplates (with Apsley House Press), 1991; Bookplate Collecting in Britain (with the same), 1992; Bookpile Bookplates (with the same), 1992; Bookplates by Lord Badeley (with the same), 1993; Bookplates from Mussett's Heraldic Office (with the same), 1994. Modern British Bookplates, published by Silent Books under their imprint only, was the 1990 free book. 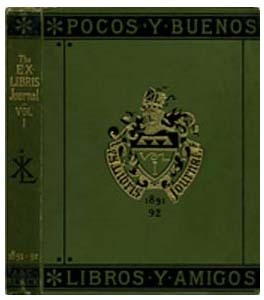 The members' volume for 1995 was Indian and Related Bookplates. Other annual books are detailed on the publications page.From 2007-8 the members book has been issued every two years, although there are exceptions: in 2013 the Society purchased, and distributed to members as their book for a single year, the residual stock of Brian Lee's British Royal Bookplates, 1992, which included information on royal dukes. Our latest book, issued for the two years 2014 and 2015, is Strawberry Leaves by Colin Lattimore, on the bookplates of non-royal dukes. The next book, already written by John Titford FSA and now being prepared for printing, will be for the three years 2016-2018 because at about 400 pages it is much larger than our standard book size. It covers some 800 bookplates of alumni of St John's College, Cambridge. Another aspect of the Society's life has been the organising of major public exhibitions. Our venues have included the Victoria & Albert Museum, the Ashmolean Museum (Oxford), the National Book League, the University of London, University College (London), the London Guildhall Library, the Fitzwilliam Museum (Cambridge), the Birmingham Museum and Art Gallery, Orleans House (Twickenham), the Mitchell Library (Glasgow), and Oxford Public Library. In 1995 we were involved in a major international ex-libris competition organised by Benoît Junod, in Belgrade. Two exhibitions relating to it were brought to Britain in the following year, one of them a comprehensive historical display of international ex-libris, the other the fruits of the competition. In 2003 an exhibition, displaying bookplates of heralds and other armorial ex-libris, took place at the College of Arms, London. We intend that our next exhibition, long overdue, will be in 2020 to celebrate the issue of our planned book on the bookplates of famous British people. If non-members come to hear of our meetings, they are most welcome to attend any (including the auctions if they come as observers). Meetings have in the past included visits to bookplate collections, both institutional and private, we have been given slide shows of ex-libris in particular styles of from particular parts of the country, we have seen practical demonstrations by artists and printers of how they produce bookplates, and we have held many gatherings at which members have brought material to display. On most occasions there are some bookplates for sale and exchange. Our meetings are generally held at 1.30pm on a Saturday, and mostly (but not always) in Central London. The Bookplate Society is informal and friendly. For 23 years from 1995 to 2017 our annual UK subscription has been held at £30, but we have introduced colour into the journal and have greatly increased the size of the members book, so to reflect rising print and postage costs we increased the UK subscription to £40 from 1st May 2017. Subscriptions alone are not sufficient to meet all the Society's costs, so we continue to make up the difference from other income, and the subscription remains extraordinarily good value. It provides a book, two journals, two newsletters, and the opportunity to participate in our meetings and auctions. Another benefit of membership is access to fellow members who may share your particular interests and be able to make exchanges with you or provide information. This provision of assistance is not limited to members - anyone who has a bookplate query is welcome to get in touch with the Society, and all letters will be answered. One person, Brian North Lee FSA (1936-2007), was pre-eminent as both driving force behind the Society and prolific author of bookplate books and articles. His output was remarkable, bringing order and interest to a field that was insufficiently documented. At the end of 2002, upon the close of his long term as editor of the Journal, the Society presented to him a silver salver engraved with his recently granted coat of arms, as an award in appreciation of his outstanding contribution to exlibris literature. Though he is no longer with us, we shall continue to honour his achievements.